panke.gallery proudly presents STREAM IN STREAM OUT a duo exhibition with Karl Heinz Jeron and Jules LaPlace. Karl Heinz Jeron has worked with the net as his material and medium since the 90s. His net art activities have involved various constellations, including with Barbara Aselmeier, Joachim Blank (as sero.org – “Blank & Jeron” 1995-2005), Gerrit Gohlke, Armin Haase and others. Works such as Handshake, International City or Public White Cube are classics, and have set the frame for discourse throughout the shifting context of their production. His sculptural works began around 2005. 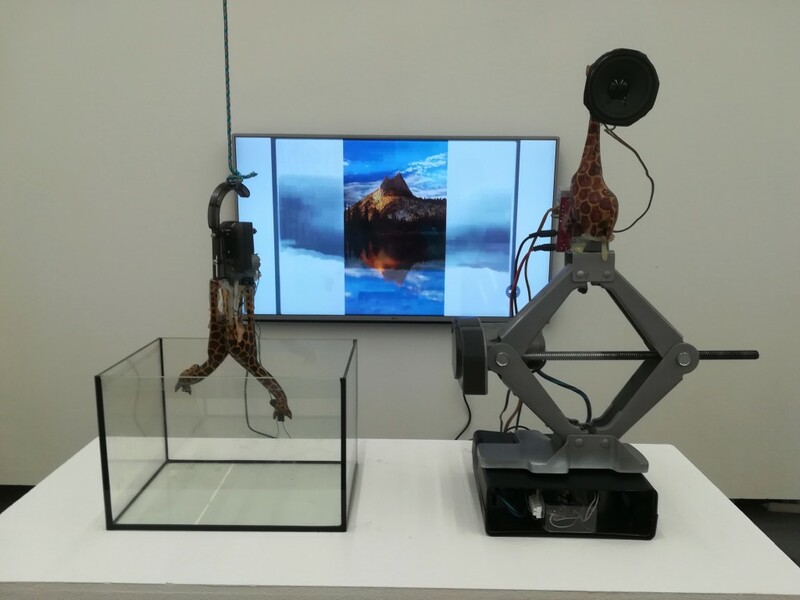 Jeron uses animatronics to reflect on emerging internet culture dominated by social media, asking old but nevertheless relevant political questions about identity, authenticity, and social control, on the one hand, but also formulating aesthetic questions of what an image is, and what text is, under networked conditions. In “Stream In Stream Out” Karl Heinz Jeron sets up an experimental situation in which he adapts his installation constraints for the panke.gallery. In Sachzwänge, his animatronics act with and connect into the social media sphere, creating a dollhouse-like experimental lab situation which will be streamed from the gallery into the web. The work is visible on our website and on social media during the gallery opening times. Jules LaPlace has worked since the mid-90s within the ASCII-art field. His work centers around creating tools for artistic and social participation and collaboration on the internet, within the internet, in the internet age. Projects like ScannerJammer and PhotoBlaster perfectly illustrate this approach, building a framework where the user is the artist. ASCII, as the archaic internet image genre, was never totally gone, and exists now shifted back from mass surveillance networks into intimate and private chat rooms, of which IRC was and is a prime example. ASCII art always gave a productive answer to what a (technical) image could be in total networked times. In “Stream In Stream Out”, Jules LaPlace will install his AsciiBlaster at panke.gallery and the panke.gallery homepage, where the audience can participate in the exhibition by creating colourful ASCII drawings which will, in turn, be streamed into the gallery during its opening times.